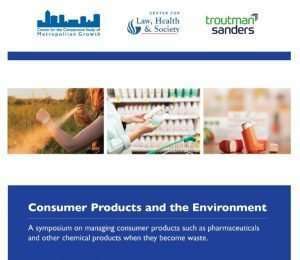 Please join Georgia State Law and Troutman Sanders for Consumer Products and the Environment, a symposium on managing consumer products such as pharmaceuticals and other chemical products when they become waste. This symposium will take place at Georgia State University College of Law on Wednesday, February 6 from 8 a.m. to 4:15 p.m. The prevalence of pharmaceutical, personal care and other consumer product waste in the environment including modes of entry, impacts to water quality and the effects on human and aquatic life. Updates from EPA on retail waste issues and a discussion of the final Management Standards for Hazardous Waste Pharmaceuticals rule. A discussion among the regulated community about implementation of applicable EPA regulations. The registration fee is $150. An optional 4 hours of Georgia continuing legal education (CLE) credits will be available for an additional $20. If you are interested in receiving CLE for a state other than Georgia, please contact Karen Johnston at kjohnston3@gsu.edu to discuss. Space is limited and early registration is encouraged. Learn more about the schedule, speakers and register for the event at law.gsu.edu/centers/metro-growth/programs/consumer-products-and-the-environment.